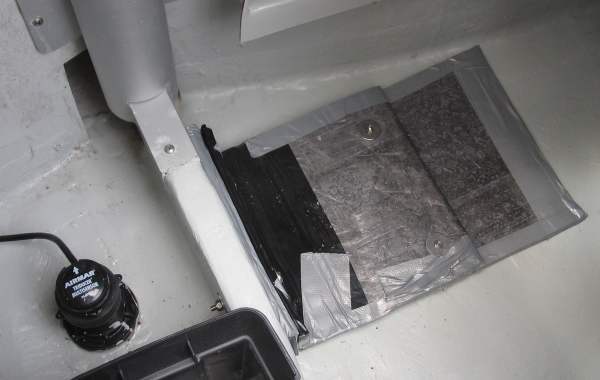 � Minimum of 4 litres of fuel in a plastic container (measured when leaving shore) as well as minimum 1 litre of fuel to be measured when returning to the shore after racing. � 22kg Ballast correctors of lead or water securely stowed below decks behind the mast support on starboard side as close as reasonably possible to the position for the engine. I don't like outboard engines, and the boat is a dinghy. We carry a pair of paddles. I really do not fancy paying Laser for a lump of lead. 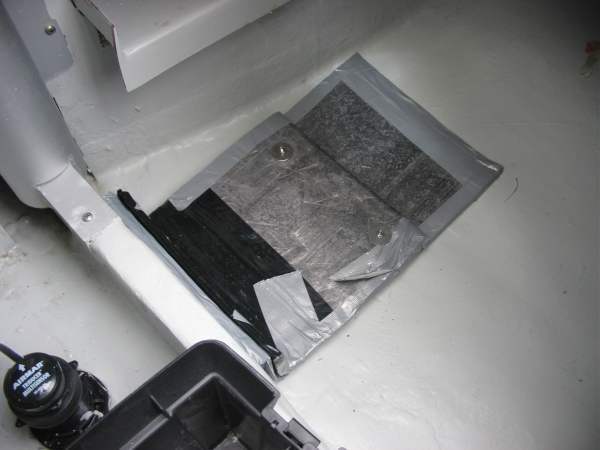 Here is how I made a set of 22kg correctors and secured them into the boat. 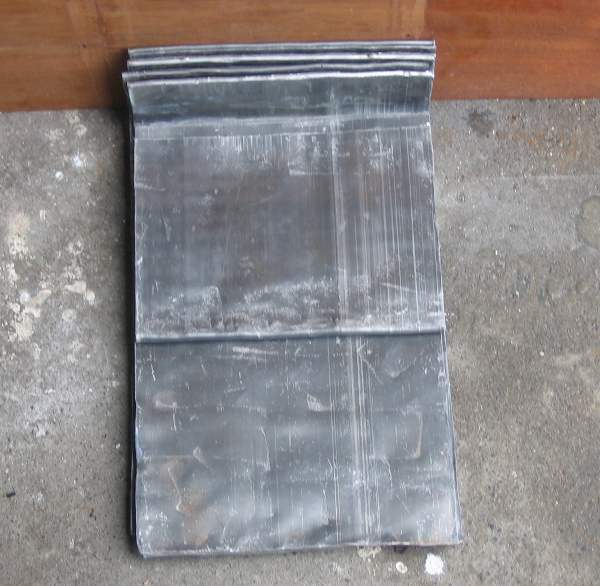 "Pigs" of lead can be purchased from metal recyclers and dive shops in set sizes of 2kg or 4kg etc. But the "securely stowed" proviso creates an installation problem. Louise's Winder-built Fireball has a pair of "pigs" totalling 12kg, bolted to the underside of the dinghy's cross thwart. That is not possible given the SB3 rules. 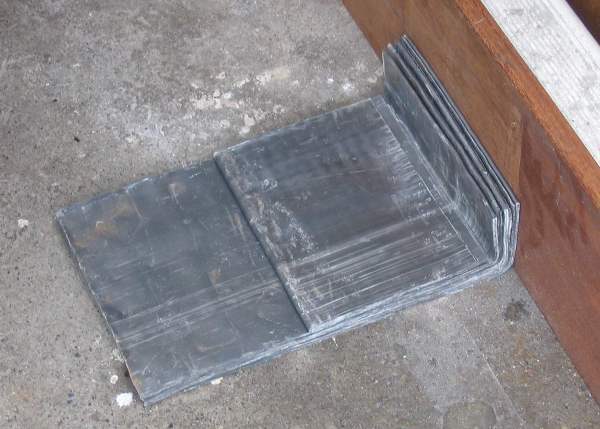 A bit of lateral thinking: we recently had our house re-roofed and the contractor used lead flashing around the chimney. 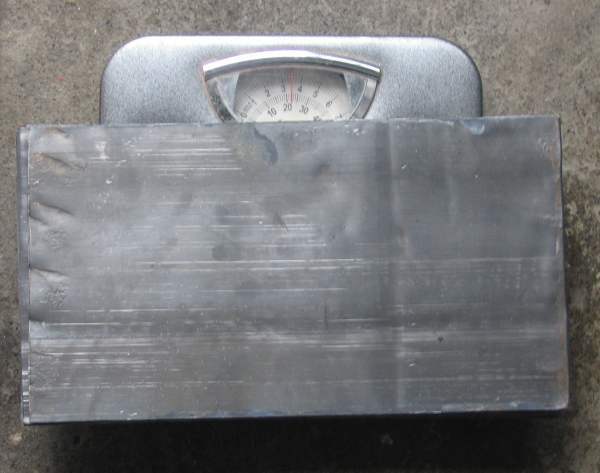 From the local builder's providers, I purchased a roll of lead flashing, 230mm wide, nominal weight 28 kg. Price euro 92. 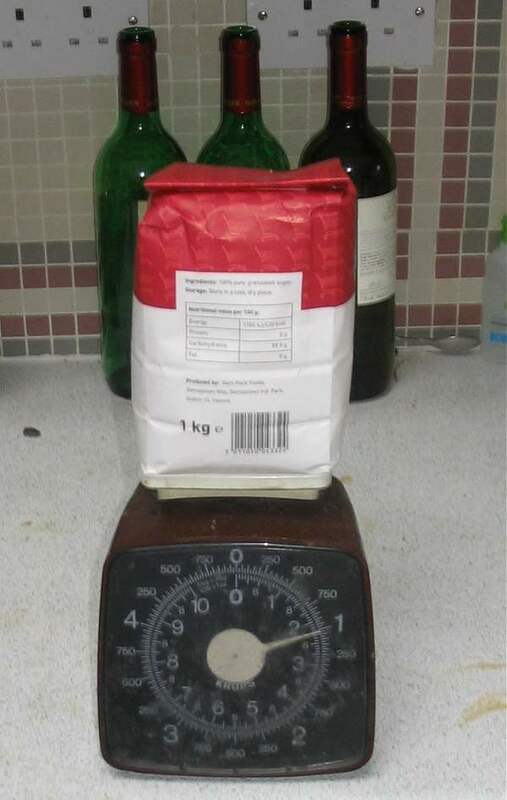 Testing the accuracy of the kitchen scales, with last night's dinner accompaniment in the background. 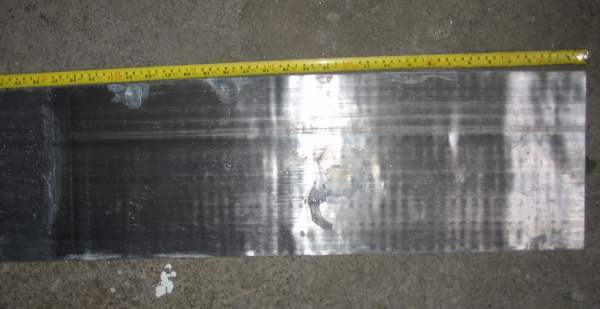 With a bit of experimentation, I established that a sheet of flashing 230mm wide and 420mm long weighed 2kg. So, I will need 11 sheets that size to total the required 22kg. 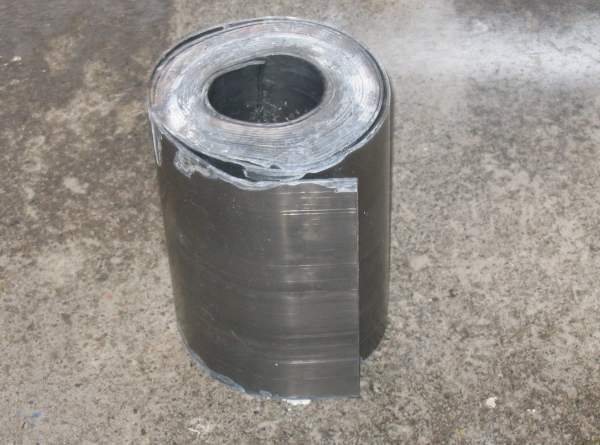 The lead is unrolled to a length of 1260mm and cut. 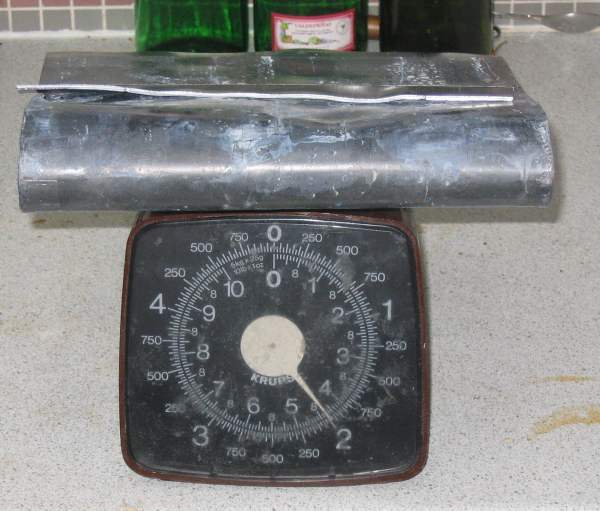 That length is then folded into three layers, giving a total weight of 6kg (420mm = 2kg). I cut four lengths, giving three of 6kg and one of 4kg. 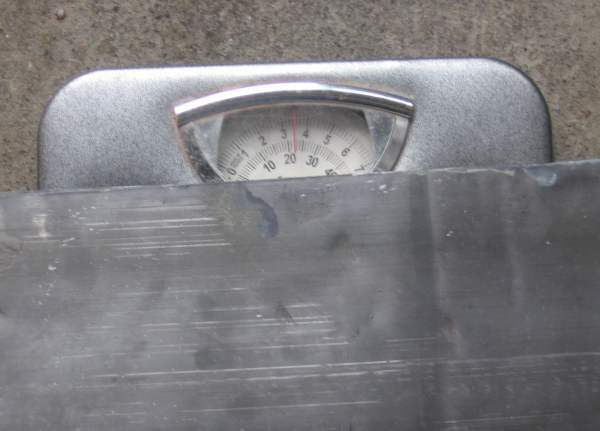 Closer view of the scale...22kg. 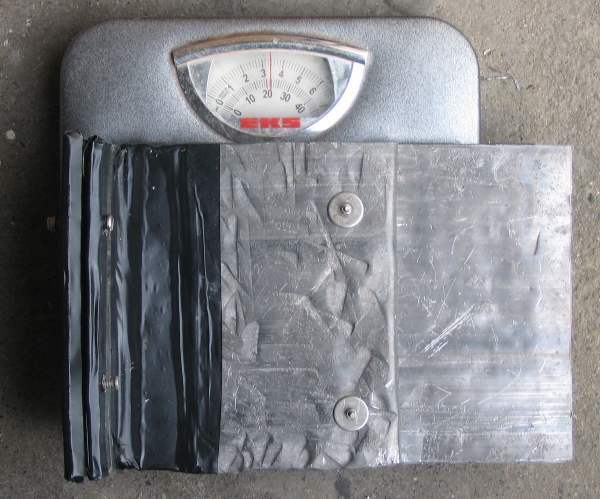 All of the sheets formed and layered on top of each other, three of 6kg,, one of 4kg. 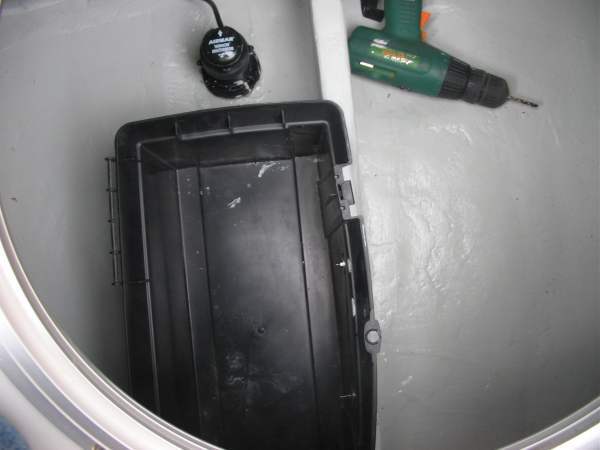 To keep them locked together, a pair of bolts with washers and nuts are used. 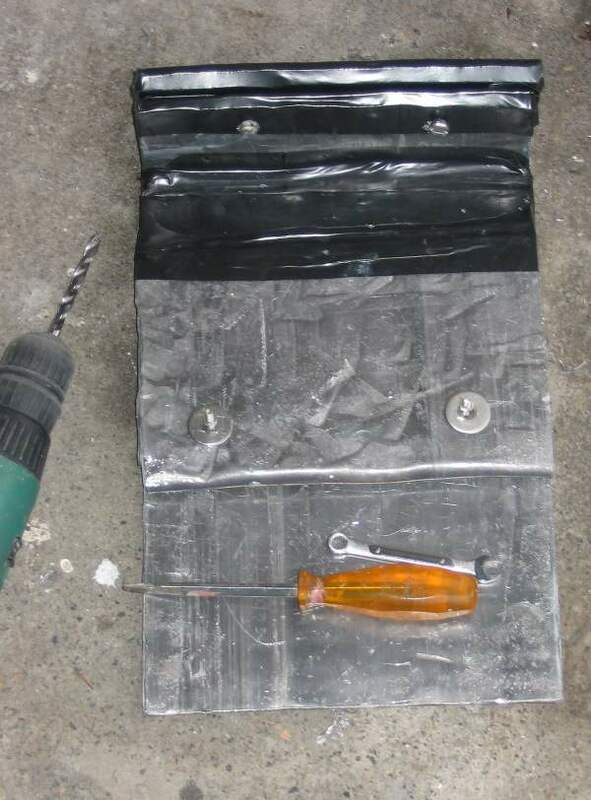 Black tape is used to cover the sharpish edges of the lead. Two holes have been drilled so that the entire unit can be securely bolted to the centre stringer in the hull. Off to the boat...the black plastic toolbox at left is home to the anchor, chain and warp. 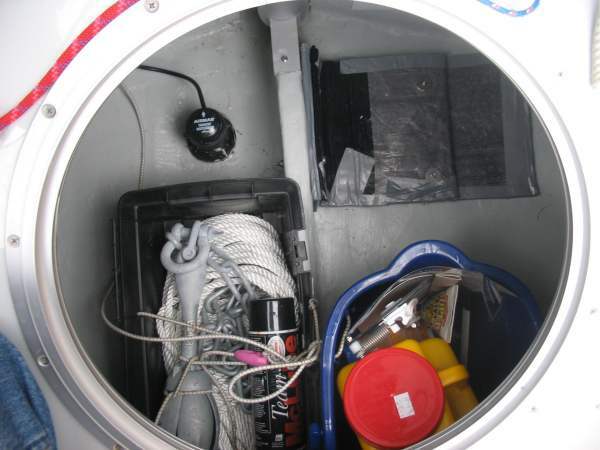 It is bolted to the centre stringer and the contents are held in place with a web of shock cord. Nothing is ever placed near the transducer, I am a small bit paranoid that something might hit it and break it and we sink! Correctors in situ, aft of the mast support, approximately where the motor head would be. 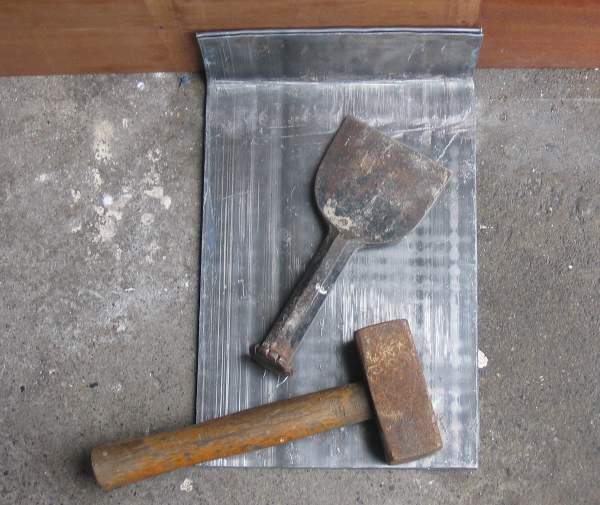 Duct tape is used an an attempt to keep water out of the layers of lead. Might be lucky! Now bolted securely to the stringer. Everything back in place. The bucket on right, required by class rules, is a square mop bucket from Woodies, held in place by slip-knotted shock cord.